You can earn 960 yards with this purchase! 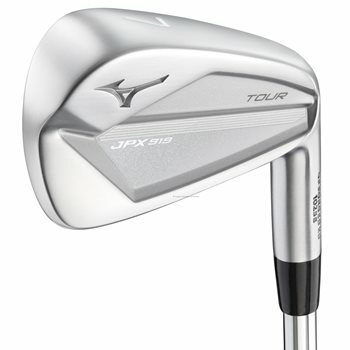 Featuring a compact profile that produces a surprising amount of distance and accuracy, the JPX 919 Tour irons are made to satisfy even the game’s elite shotmakers. It allows for tight distance patterns even from off center strikes. The Grain Flow Forged High Density is made from a single billet of 1025E mild carbon steel to give you Mizuno’s softest, purest feel ever. The chrome plating features a new pearl finish for increased durability and to soften the 919’s precise lines in bright sunlight.